This villa is easily large enough for five couples traveling together or a family vacation. There’s tons of space, and every bedroom has its own patio, which is so nice when you need a break from conversation to take in the soothing view. If you want to explore the island, I highly recommend snorkeling off Mahoe Bay- the sights and convenience can’t be beat! A minute walk to the beach! Loblolly Villa is perfect for travelers who want their own space and easy access to activities. 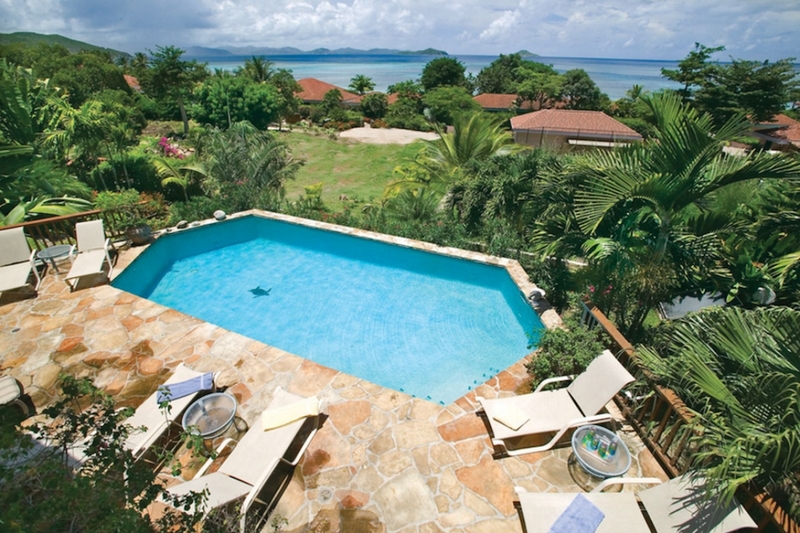 It’s a short walk from the tennis courts and Mahoe Beach’s white sand and snorkeling reefs. Built on two levels, this villa offers ample privacy for every guest. The large pool is surrounded by a stone deck, and sunbathers will love stretching out on the loungers around the pool. A shady area next to the pool deck is furnished with patio furniture and a hammock, perfect for afternoon naps or catching up on summer reading. Step into the airy and well-equipped Great Room, which holds the open-plan kitchen and dining area. A breakfast bar separates the kitchen from the rest of the space. Take in the views from the covered gallery’s hanging swing, or play at the ping pong table. Two air-conditioned suites flank the Great Room, each with lots of privacy, an ensuite bathroom, and patio. A staircase leads down to the lower level, where four more air-conditioned bedrooms sit around the pool and deck area. Two of these suites have king-sized beds, and two have twin beds. Well-designed for privacy in the suites and fellowship in the common spaces, Loblolly is the ideal villa for a large family or group holiday. Mahoe Bay Beach is 5 minutes from the property, and Spanish Town is only a 10 minute drive away. Two minute walk to Mahoe Bay beach. A credit card imprint required on arrival for damage deposit.